As we begin to wind down following the last event of 2016 that took place at Epsom Downs Racecourse, Care Roadshows is taking the time to reflect on the years’ achievements. 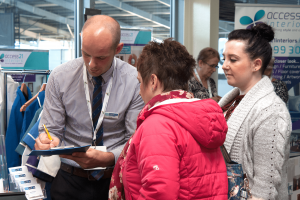 Care Roadshows has travelled all over the UK providing its visitors with the opportunity to source new products and services, specifically designed to be used to care for older people. The first pit stop of the year began in Glasgow where Rami Okasha from Care Inspectorate went into detail regarding the new National Care Standards and the key principles that will apply across all social care and health provisions in Scotland. The seminar rewarded its attendees with advice on how the new approaches to inspection of regulated services can be implemented in different settings. Moving down the country, Liverpool visitors got hands-on with an interactive workshop presented by Happy Days Dementia Workshop & Nostalgic Design. The entertaining yet educational workshop comprised of sharing tips on social engagement, themed activities and nostalgic environments for all care services – a key feature following the recent news of dementia being the leading cause of death in the UK. The next stop for Care Roadshows saw the highest number of visitors attend since the show began in 2011. Villa Park Stadium in Birmingham saw hundreds of passionate care professionals enter the doors keen to hear from Sheila Scott OBE from National Care Association along with Alzheimer’s Society who stimulated an important discussion leading on own experiences regarding dementia care across the UK. Each event is tailored for the location and Cardiff was no different. David Francis from Care and Social Services Inspectorate Wales (CSSIW) was in demand following his packed seminar focusing on the changes to regulation, inspection and enforcement. The Welsh community required clarification following the R&I Act and David was one hand to provide answers to the many questions. 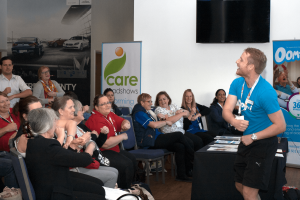 Visitors were also inspired to clap and join in the fun at Oomph’s popular workshop to help motivate and introduce a varied active programme in any care setting. The final stop in the 2016 calendar was in the capital, London, and welcomed to the stage Segun Oladokun, Head of Inspection London South, from CQC. Visitors left the seminar feeling informed and inspired following Seguns’ explanation of the findings from the 2016 State of Care report. 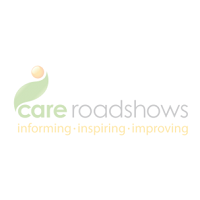 This was the first year since birth that Care Roadshows collaborated with QCS as Headline Sponsor who offered tremendous support throughout the journey. Quality Compliance Systems (QCS) is the UK’s leading supplier of compliance, quality assurance and policy management systems to the care sector and we were delighted to have them on board and participate at each event. QCS provided hundreds of visitors with insights and guidance about how to negotiate the maze that is providing a regulated care service. At each event Ed Watkinson, their Director of Care Quality, shared his wide experience of regulation to deliver a seminar on how to achieve outstanding ratings. 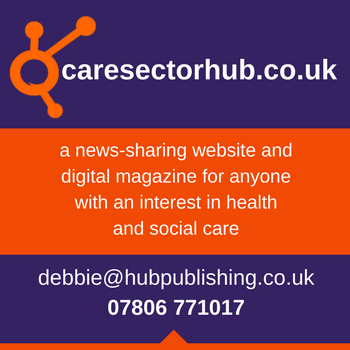 Ed stated ‘We have loved working with the team at the Care Roadshows and have always found them to be flexible, supportive and professional, we also found the events extremely productive and it was great to meet so many clients – both existing and new’. Registration for the events will be announced shortly. 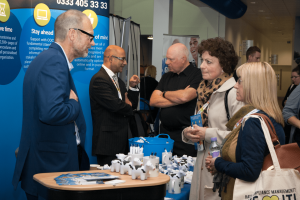 If you are interested in exhibiting at Care Roadshows, please get in touch with the team today. We look forward to seeing you in the new year. Care Roadshow 2017 registration will be open soon. Click here to register your interest to the events.